The Gospels present the life of Jesus. Acts gives us a history of the earliest church. The letters offer us insight into the early church problems and challenges. Revelation gives hope for the future. But what about the Old Testament? If you look carefully at the pages of your favorite Bible you may find the pages of the New Testament worn, ragged and filled with notes. But the pages of the Old Testament are almost pristine from lack of use. Few would argue that we need to improve our knowledge of the Old Testament. The writings of the Old Testament bring us from Creation to within about 400 years of the birth of Christ. And then, it stops. In fact, it ends with a depressing rebuke from God when the people are told their sacrifices have been rejected (Malachi 1:10). Yet the prophet still holds out hope and points to the coming redeemer (Malachi 3:1-5). Four centuries later the prophetic voice would resume from a strange man who wore rough clothing and ate locusts for his meals. John the Baptist would speak the Lord’s words (Matthew 3:1-6). 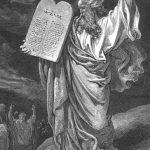 The Old Testament consists primarily, but certainly not exclusively, of the Mosaic Law given at Sinai. The Law was given through Moses. The prophets tried to call the people back to that Law. But that covenant was brought to an end by Jesus (2 Corinthians 3:10-11; Galatians 3:21-29; Colossians 2:13-14; Hebrews 8:13; Hebrews 12:25-29). 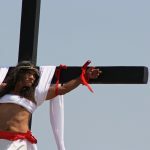 So if it was “nailed to the cross” how should we view it? 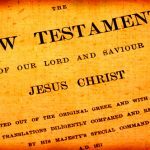 Is there any value in t he Old Testament today? Yes! The Old Testament Law of Moses was a teacher. It was there to guide us to a more mature faith in preparation for the coming of the Son of God (Galatians 3:24). Although we are no longer under the Law (vs. 25) we can still learn from it. It is impossible to fully understand and appreciate the New Testament without an understanding of the Old Testament. We should study and know the Old Testament because the New Testament writers taught from it. One source estimates that almost 5% of the New Testament verses contain Old Testament quotes or allusions. New Testament writers used the Old to prove their assertions and add credibility to their teachings. Hebrews may the strongest such example. It is filled with Old Testament passages. We should know and study the Old Testament because it teaches us about God. God himself does not change (Hebrews 6:17; Hebrews 13:8) but his methods for dealing with man do. Therefore the characteristics of God as presented in the Old Testament are valid for us today. His purity, holiness, righteousness, divine anger and judgment, mercy, patience and so many other qualities are vividly on display in the Old Testament. These qualities do not change. We should know and study the Old Testament because deep and abiding spiritual lessons are taught through earthy, simplistic examples or “shadows.” For example, the role of blood in redemption is taught first in connection with the Levitical priesthood (Leviticus 17:11) but its fullest expression comes in the crucifixion of the innocent Lamb of God at Calvary (John 1:29; Luke 22:9; John 19:34; Romans 5:9; Acts 20:28, et al). The veil of the Temple (Exodus 26:31-35) was a stunning reminder that men could not approach unto God because of their sins. Yet, in Christ, that veil is torn apart (Mark 15:38) and access is now possible. It is possible because Jesus went there before us (Hebrews 6:19-20). Now we can approach the Father with boldness (Hebrews 10:19-25). The significance of the Hebrews passages would not be so clear were it not for a knowledge of the Old Testament. Numerous other examples would be possible but this seems to adequately present the case for a better study of the Old Testament. Some parts of the Old Testament are confusing to the modern reader but with diligence the veil can be pierced.